Rouen, the capital of Normandy, is a historic and beautiful city in Northern France with plenty of things to see and do! Rouen is famous for being hugely important during medieval times. It is significantly known as the place where Joan of Arc was burned at the stake, giving a special meaning to this city and making it a place full of historical interest. 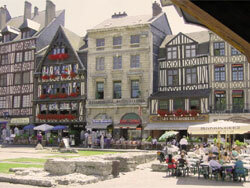 Rouen, the capital of Normandy, is most notable for being the place where Joan of Arc was burnt at the stake! However, the city has so much more to offer than medieval history. In 2013, Rouen celebrated the 25th anniversary of the Armada and millions of visitors to come and admire the 50 ships sailing from all over the world. People had the amazing opportunity to get onboard several of these ships and have a tour around them. The festivities also included fireworks as well as free concerts of French and international artists such as Mika! 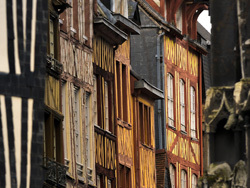 Whether you are into sports, history or shopping, Rouen certainly has something in store for you! The city has two shopping centres, one on each side of the river Seine. In the South, you will find the Centre Commercial Saint-Sever which hosts most of the high-street brands whereas in the North, Les Docks 76 offers less common shops and boutiques.